These three late 40's era digest-sized books combine two of my big collecting loves-- vintage paperbacks and sideshow/circus related ephemera. Gotta love it when things you love collide...that sounded unintentionally perverted. But oh how I love perverted. 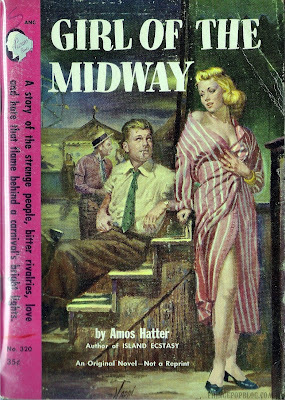 Rudy Nappi cover on "Girl of the Midway" and George Gross cover on "Carnival of Passion." 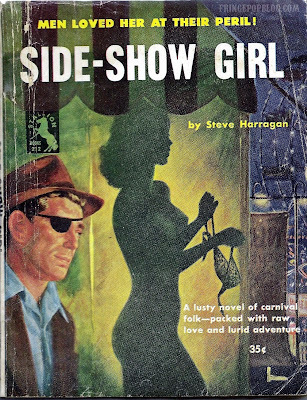 Not sure who did the cover art for "Sideshow Girl." I'm enjoying your posts immensely, Astrid! Keep up the good work. fyi: I have an assoc. that has a couple of signed pitch cards, (70s/maybe a little earlier in one case), of Little Eddie Taylor, "Fat Albert", ( aka Kent Nicholson), and a cat named Sandoval. Available. Thanks for the compliment! It's good to hear words of encouragement as an incentive to keep posting. As far as sideshow memorabilia goes, I'm not much in the buying mode at the moment. We have a small business, and the bad economy prevents us from buying much. Anyway, take care and thanks for your message!